I love books. I love Christmas. 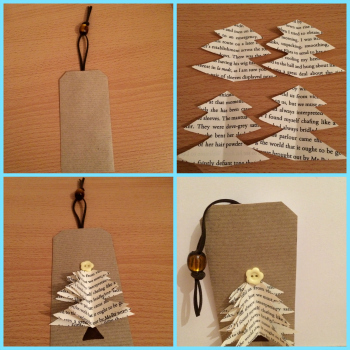 So I decided to combine them and make some Christmas - or Bookmas - gift tags. 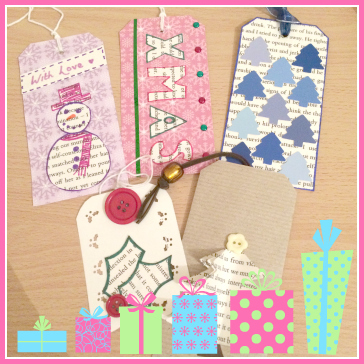 I used luggage tags as my bases but you can create your own using card if you like. Remove the string from your tag and cover in festive paper using glue or double-sided tape. I used paper with a purple snowflake design. As the hole for the string has been covered, you will need to make a new one in the paper. Push a pencil through the paper, through the hole already in the tag. Place a blob of plasticine or blu tack underneath the tag so you don't bend or tear it. 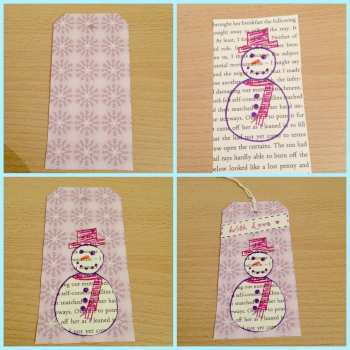 Draw a snowman design on a piece of book proof paper. I used Sharpie pens, which didn't bleed on the paper. Cut out and stick onto your tag. Trim off a blank rectangle of page proof paper and stick onto your tag, trimming off the excess on the sides. Write a message and draw small dashes along the edges to create a border. I used the same colours from the snowman to tie it all together. Pop the string back through the hole and you're done! 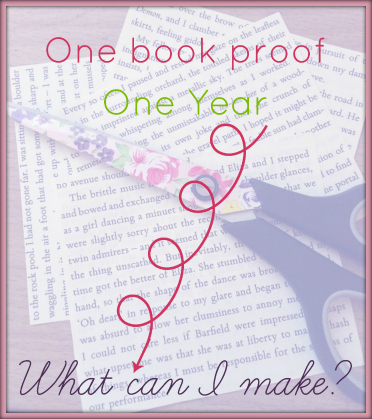 Remove string from your tag and cover in a book proof page. Pierce a hole (as above) and draw a thin line in dark blue along the edge with a Sharpie pen. 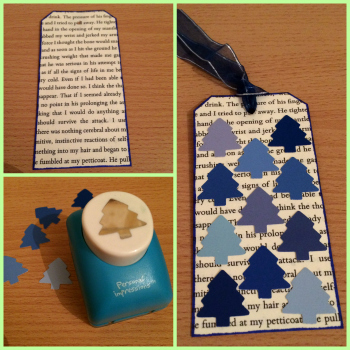 Using a Christmas tree punch, punch out eleven trees in various shades of thin blue card. Stick the trees onto the tag. I mixed up the shades but you could arrange them so the shade changes from light to dark. Add a dark blue ribbon and you're done! 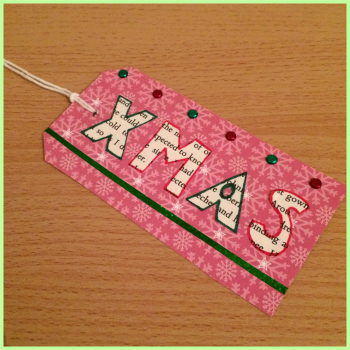 Trim your gift tag and create a border with a holly punch, rounding off the bottom edge and the top corners. Create the holly by drawing two leaves on your book proof page and cutting them out. Stick the leaves on the bottom left corner and add a small red button. To finish off, stick a large red button at the top, covering the hole where the string is threaded. Remove the string from your gift tag. I wanted to add a beaded ribbon so I stuck this down using double sided tape before covering the tag in brown paper. Layer four small sheets of book proof page, fold in half and cut out half a Christmas tree shape. Unfold and stick one tree to the tag. Apply a small amount of glue or double sided tape down the middle of the tree and stick the next tree over, making sure you line up the edges. Repeat for the third and fourth tree. Fold the layers of tree towards the centre to create movement and a stick a button to the top of the tree. I used a yellow flower but you could use a star. As above, remove the string and cover your gift tag in decorative paper and pierce a hole for the string. I used a pink snowflake design paper. 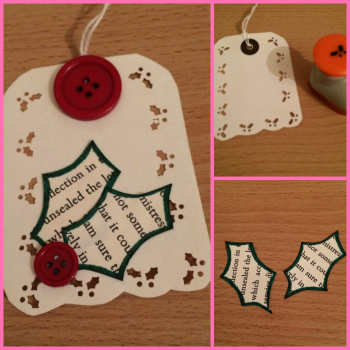 Using red and green Sharpie pens, draw and cut out the word 'XMAS' on your book proof page and cut out. Stick the letters across the centre of the tag. Stick a thin strip of green holographic paper or card across the bottom and add small red and green brads in a row above. I used the centres of the snowflakes as a guide. To finish, back the tag with white card so the backs of the brads aren't showing and pierce a hole for the string. Re-loop the string and you're done! So that's my five gift tags. These are just a few ideas of what you can make and there is a ton of inspiration on Pinterest. I'd love to see what you come up with!